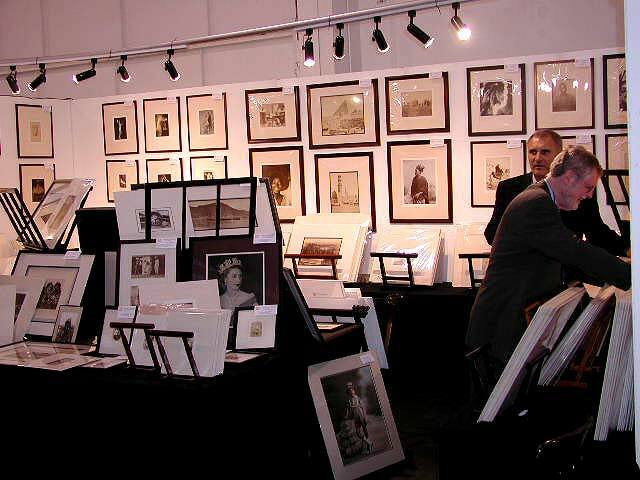 photo san francisco opening night is notable for its impressive array of fine vintage and contemporary photographs from over 80 top domestic and international dealers as well as for its weird food. A couple of years ago, a large tureen of mashed potatoes headlined the delectables selection, and I thought that took the cake, but it was peanuts compared to this year's fare. The evening's highlight, in my culinary opinion, was the quartered baloney slices, their uniform pale pinkness interrupted by occasional embedded peppercorns. Few sampled this gastronomic anomaly, possibly indicating that people who collect fine photographs also know something about good diet. I didn't think baloney was still legal. Next came the spill-defying salad section, the standout being a warm red cabbage slaw-- one bobble here and you brand yourself like a Grade A steak. 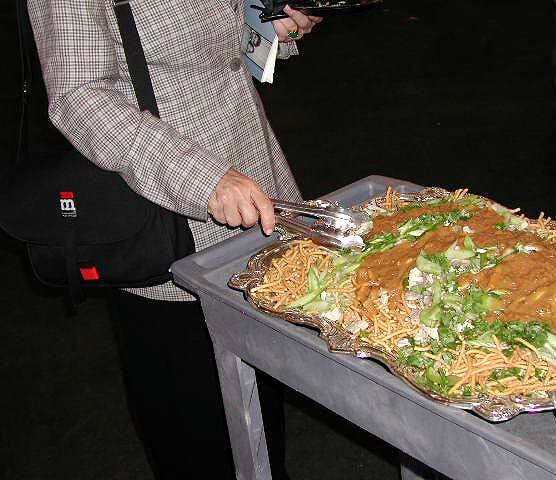 A pasta dish with long slender noodles and a Chinese chicken salad, though more forgiving in the stain department, rounded out the treacherous triumvirate, all of which had to be skillfully maneuvered onto tiny plastic plates and then eaten with plastic forks. "Sweetie... take that noodle off your lapel and let's go see some Cartier-Bressons." As if that wasn't enough, the jerked barbequed pork was a bit too cohesive, thereby increasing its dribble factor. I'm sure I speak for all of us when I say that I expect my pork to be fully jerked. Very tasty. 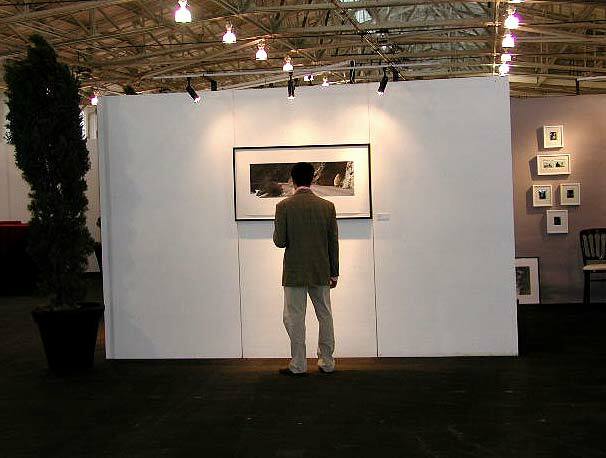 Now that I'm sated, photo san francisco 2004, the fifth annual San Francisco Photographic Print Exposition, runs from July 22-25, 2004 at the Herbst Pavilion, Fort Mason Center, directly on San Francisco Bay. The opening night preview benefits The Fort Mason Center's Historic Preservation Fund, a foundation dedicated to preserving this former military base, now a national historic landmark. The crowd was decent, though lighter than last year; celebrity-watching was better than usual with Supervisor Mat Gonzalez and George Lucas among the luminaries in attendance. 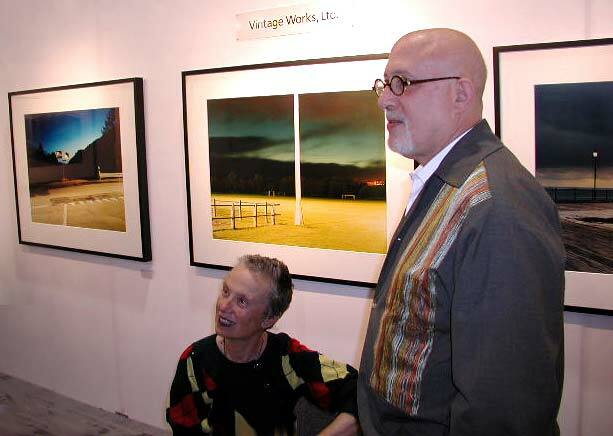 As usual, everyone enjoyed the finest in vintage and contemporary photographic images, eclectic people-watching, and adding quality photographic works of art to their collections. Photographs and photographic books on display range in price from under $100 to $200,000 by many of the world's great photographers including Diane Arbus, Ruth Bernhard, Henri Cartier-Bresson, Imogen Cunningham, William Eggleston, Walker Evans, Larry Fink, Robert Frank, Lynn Geesaman, Judy Gelles, Lauren Greenfield, Andre Kertesz, Man Ray, Ken Ohara, Luis Gonzalez Palma, Robert Polidori, Aaron Siskind, Paul Strand, Josef Sudek, Weegee, Gary Winogrand and many others. The selection is on the conservative side, however, with only spotty alternative offerings such as those at The Photography of Burning Man booth, but even they're a bit tame. 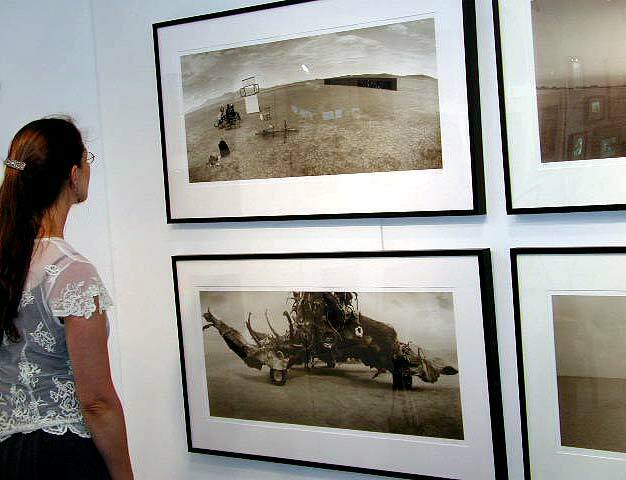 Lectures and seminars also take place with speakers including Joel Peter-Witkin, David Maisel, and Alec Soth. 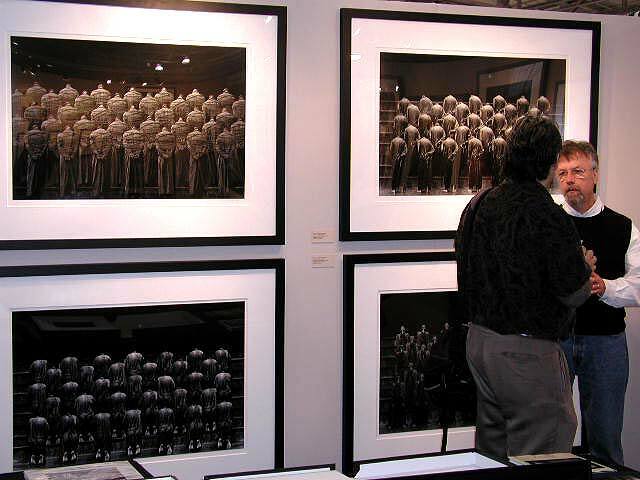 No matter what your interests or what your budget, photo san francisco 2004 is unquestionably your best opportunity in Northern California to see a great selection of the finest photographic art on the market today. Exhibition hours are Friday, July 23th & Saturday, July 24th, noon to 7pm. Sunday, July 25th, noon to 6pm. Tickets are $15 for one day and $25 for a 3-day pass. Misha Gordon photographs the same model in different poses, then combines them in the darkroom the old fashioned way (no computer), to create his Crowd series, $6000-$6500 at Volakis Gallery, Yountville. 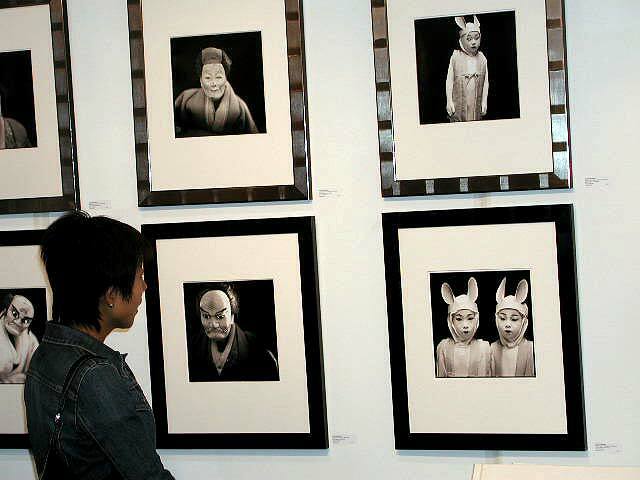 Hiroshe Watanabe selection at The Photography Room, Grand Rapids, MI. $500-$700. Burning Man images by A. Leo Nesh at The Art of Burning Man, curated by Barbara Traub, San Francisco. $2400. 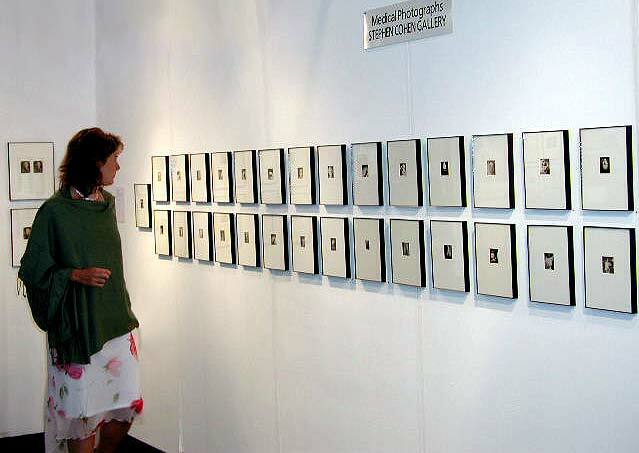 Medical photographs at Stephen Cohen Gallery, Los Angeles. $250-$350. 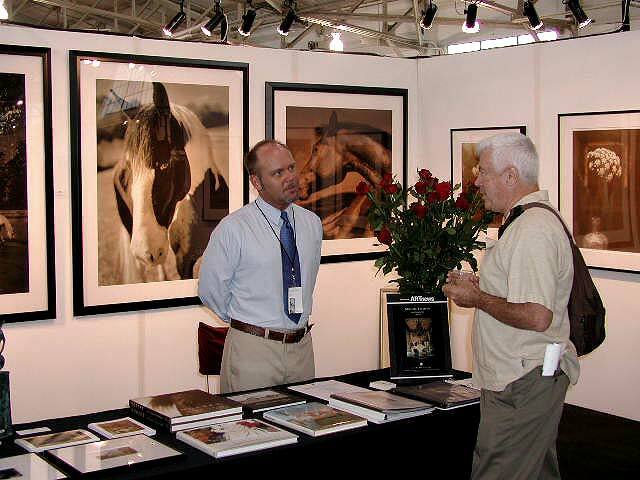 Equine art by Michael Eastman, Iris prints, at at Lisa Kurts Gallery, Memphis, TN. Choice of sizes, $1300-$12000. Forgot to get the details on this one. Sorry. Urban Sport (center) by Marcus Doyle at Vintage Works, Ltd., Chalfont, PA. $2800. 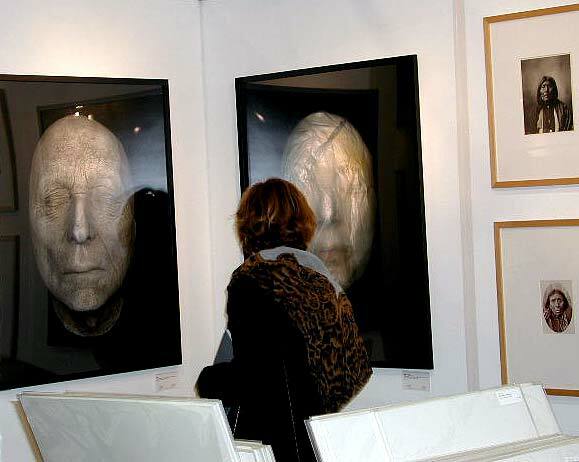 Masks by Torben Eskerod at Northern Light Gallery, Bronshoj, Denmark. $2500.